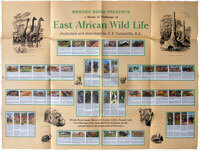 The wallcharts for East African Birds (Series 1 and Series 2) are well known and the wallchart for East African Wild Life to a lesser extent. Recently two previously unrecorded wallcharts have been discovered which provide new information on the release of cards and wallcharts in Africa. The wallcharts for African Birds and African Wild Life may possibly have been printed for educational purposes only, which like the early GB wallcharts would explain their scarcity. 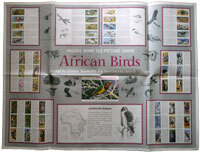 The African Birds card set is recorded as being issued in Rhodesia only, the pictures on this wallchart are the same as those on the cards but are not in displayed in numerical order and the layout of the pictures is purely aesthetic. The wallchart for East African Birds appears to be the same with the exception of the wallchart centrepiece, where the picture of the album is missing and the word 'East' appears in front of the wording 'African Birds'. 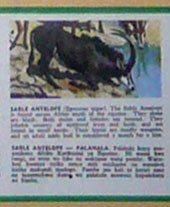 The African animals card set was issued in Rhodesia & East Africa, as well as South Africa. Whether this wallchart was made available in all african regions is not known. The pictures on the African Animals wallchart are the same as those on the cards issued in Great Britain, Rhodesia & East Africa and South Africa but as with African Birds are not displayed in numerical order. Interestingly the text does not read the same as the cards or the album. It should also be noted that the cards are ordered differently on the two different African wallcharts. Please also note that the bi-lingual African wallchart text does not match the that on the back of the South African bi-lingual card set. 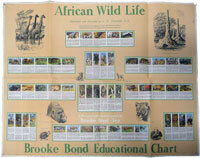 The African Wild Life wallcharts issued in Great Britain and Africa appear identical, including the address; "The Berkshire Printing Co Ltd. Reading Berkshire England" (bottom left corner). The only difference between the two (that can be seen from the scans kindly provided) is that the text underneath the cards differs. The African wallchart uses bi-lingual text whilst the GB version is only in English. Of further interest isthat although the text on the two African Wild Life wallcharts is bilingual, it differs on both wallcharts. Both wallcharts measure approximately 733mm x 990mm.